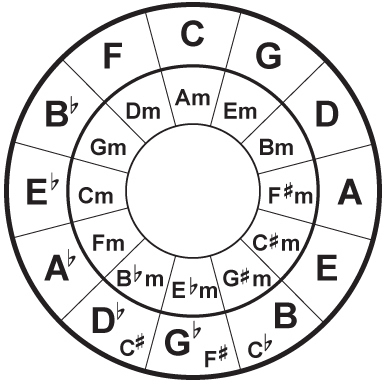 This diagram is called the Circle of Fifths, it is the basis of all music theory. Students of music are told to memorise this diagram, so that they can easily change the key of the music that they are playing. You can find out more about music theory by Googling "circle of fifths", but for now you can discover the secret of making this diagram a very powerful song writing tool. Don't worry about the funny symbols to the right of some of the letters, the one that looks like a "b" is a flat - the sound of the note is made slightly lower, and the one that looks like this # is a sharp - it makes the sound of the note slightly higher. All you need do for now is practice the chord shapes below. The outside circle of this diagram is made up of twelve letters, these correspond to the key that the music is in, and are the root chord of that key. Don't worry if you didn't understand that last sentence, all you need to know is that the chord that appears most frequently in the music is usually the root or key that the music is in. The chords that exist either side of the root chord sound great with that first chord. The chord that appears on the inside circle below the root chord is called the relative minor chord. Minor chords sound more mellow or sad. These four chords will be enough for most of your song writing, but also look at the chords on either side of the relative minor - these chords used sparingly will bring texture and interest to your writing. The chord one step clockwise of the root can be played as a seventh if you wish. Using the seventh will make the listener want to hear the root chord next. Try it out for yourself. That's about all there is to all the music theory that you will need to write great songs! If you want to work out what chords are in a song, listen to it playing one chord from the outer circle all the way through, until you find the chord that sounds good throughout most of that song, and nine times out of ten, the song is in that key. Once you have found that chord, the chords either side of it, are most of the chords used in the rest of the song, the chord below the root you have found, is the relative minor, that chord is probably in there too. It is now just a case of fitting them all in. This technique works for most songs - try it and you will be amazed!